Of course you want the best wood floor finish that you can afford. After all, your new floor was a major investment. Or, your antique wood floor might be your houses greatest asset. So, you want the best wood floor finish and lots of it, right? And that's polyurethane, right? And more is better right? 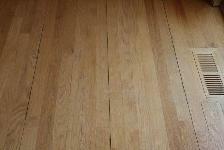 Well...first of all, wood floors can be protected with finishes other than polyurethane. Hardening oils, penetrating oils, soft waxes. In regards to polyurethane, "poly" means plastic. It is pourable plastic that hardens to a solid shell. Polyurethanes discolor, also, either from sunlight or oxidation or both. But the biggest concern regarding excess polyurethane is NOT aesthetics. See the repeating crack in the 2 1/4" Red Oak floor? This floor was a traditional nail down floor. It was laid, (correctly,) across the floor joists, not with them. But the oil base poly that was poured over this floor eventually hardened like a thick blanket. The wood floor wants to move, in fact, it has to move. In this case, the plastic held for six boards, and then lost. Held another six boards and then lost. In effect, the polyurethane blanket meets its tensile match every six boards. A "fat" wood floor finish is the most likely finish to panelize a wood floor. You will hear the thickness of plastic sheeting measured by "mil". So, a floor guy might say he put down a 6 mil vapor barrier in a crawl space. What he really means is 6 micromillimeters. From top to bottom, a floor coating shouldn't be anymore than 10 micromillimeters thick. Finish manufacturers know such numbers, but how's the average guy supposed to know? Look at the coverage rate on the can. If a gallon covers 350 to 400 square feet, and it's a top coat and not a sealer, then it is a fat finish. Two coats of a fat finish will already put you at 10 mil, so think twice before you decide on that extra coat. I want to be clear--fat finishes are very tried and true and not every floor will panelize because of them. The installation, fasteners, and prevailing humidity swings are also factors in this panelization problem. 600 to 750 square feet is more like it if you are a candidate for it. This is a healthy thickness that more likely won't panelize. Each coat equals approximately 2 mil.